Yesterday you saw how Sony's newest console stacks up to the competition but what about its little brother, the Vita TV? According to my tape measure, this little guy is only 10.5 cm x 6.5 cm (around 4 in x 2 1/2 in). Having problems imagining that? Well let's compare it to some other video game objects. 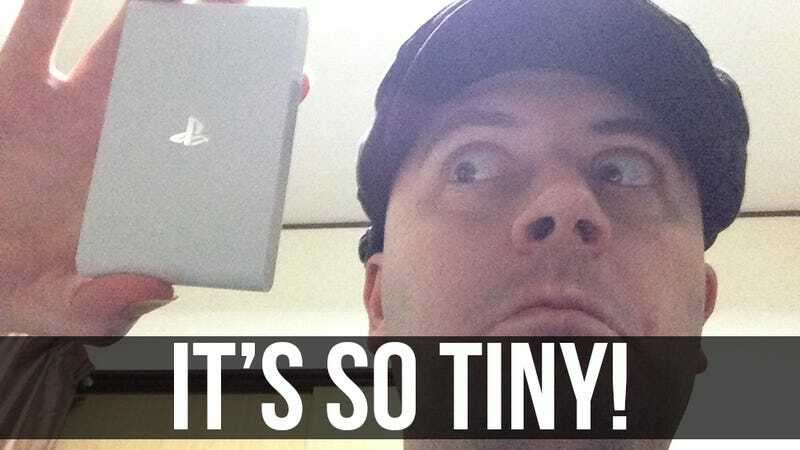 The Vita TV is smaller than a Vita game case. Almost as thin as one too! It's even dwarfed by its own controller. Here's how it stacks up to the competition. Oh look! It's big brother PS3 is giving it a piggyback ride. The whole Vita TV unit is about the size of the original Vita's screen. The Wii U tablet's screen could consume it. And lastly, here it is next to classic RPG Lunar: Silver Star Story Complete. But why is Lunar in this picture? The correct question is "why isn't Lunar in every one of these pictures?" Think about that. Well, now that my Vita TV has been un-boxed, it's time for me to see how it works. Check back with Kotaku East tomorrow to see my first impressions of the system.